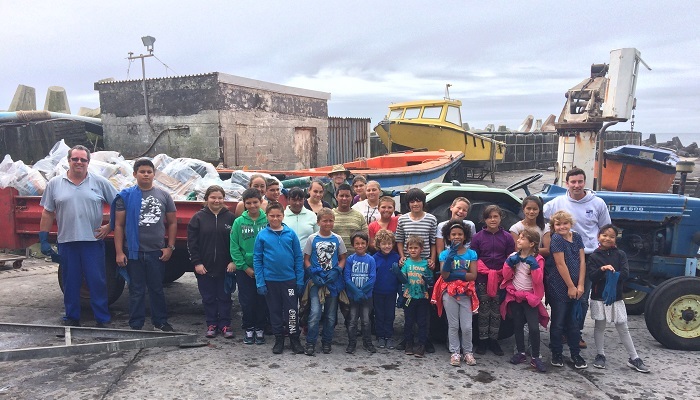 At the suggestion of the fish factory manager, school students spent a day clearing rubbish from the beeches around Calshot Harbour. 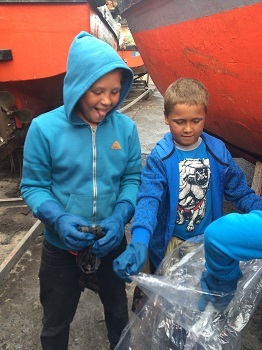 This autumn term, St Mary's were invited by the crayfish factory to take part in a harbour and beach clean up, as Erik MacKenzie, the factory manager, had noticed a lot of rubbish had been washed ashore in the recent storms. Erik MacKenzie with St Mary's School beach clean up team, Mr Len and Mr Lamont. All the pupils from Class 1 to Class 5 went down to meet Erik at the harbour in the afternoon. 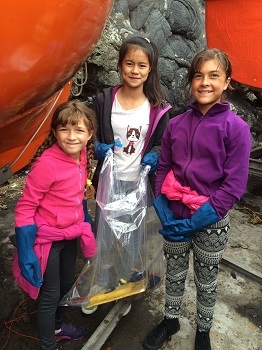 They were issued with thick gloves to protect their hands and bags to place the rubbish in. 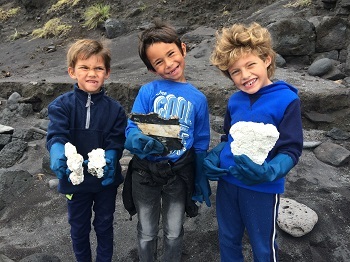 Erik also warned them not to pick up anything sharp and to watch out for the Blue Bottle jelly fish (locally known as Man of War), which can give a nasty sting. There was a tractor for full bags, and the adults helped with the heavy lifting. The children then organised themselves into teams and went to work alongside several of the staff from the factory. Everyone was really impressed with the speed and enthusiasm the children showed as they set to work, and in less than an hour the west side of the harbour and the beach was spick and span. They found a mixture of debris including plastic bottles, rope, shoes, and clothes, and the tractor trailer was full of bags of collected rubbish. After a quick drink and snack, some of the children insisted on doing the east side of the beach as well. They cracked on for another hour, and didn't finish until after the end of school. 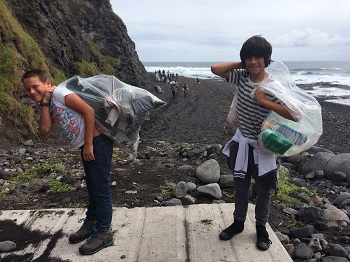 A big well done to everyone who helped, and a big thank you for helping keep the Tristan da Cunha beach a clean place for everyone to enjoy. Kieran and Nathan. Connor, Lucas and Aiden.